Well I can't believe another Christmas is nearly here, we will again be closing the shop over the Christmas / New year season. We finish up at 5pm on the 23rd of December and don't come back until the 3rd of January 2012. This year has really flown by, we have all produced some great projects and there are more in the pipeline, like all stitchers we have more than one project on the go and our brains will keep ticking over thinking of new things to do even though we are taking a break from stitching. Hope you all have a great Christmas and a Good start to 2012 and it brings you every thing you wish for. Small Pink Myreska doily - this is a style of withdrawn thread work which comes from the Ukrain. 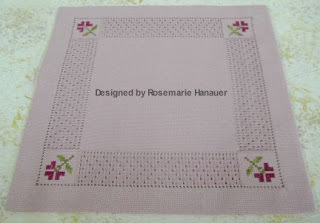 both project are by Rosemarie Hanauer, for more information and advance details of future classes please check our web site under Classes. 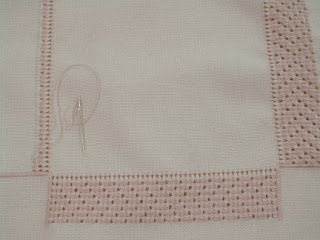 Gunter is at the moment re stitching one of our Primke projects a Myreska doily, we can no longer get the Pink Lugano that it was originally designed in as our wholesaler is no longer importing it to Australia. 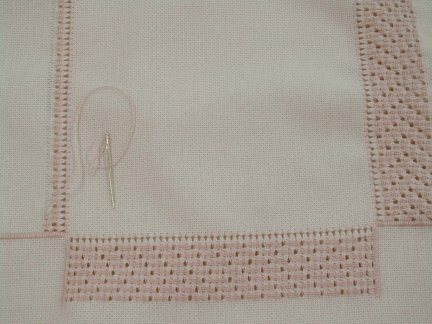 We have decided that the easiest solution is to dye our own pink Lugano, this one works really well with DMC 225 and as this is available in 5, 8 and 12 perle it will also work for anyone doing Hardanger Embroidery. We are please to let you know that we are now able to sell our Primke Designs projects as PDF files. At the moment it is only the latest projects that are available, but we are slowly changing all our notes over. If you have a look on the Christinascraft website, you will see the ones that are available, we can offer these at a much reduced price, compared to the hard copy ones and of course there is no postage involved. 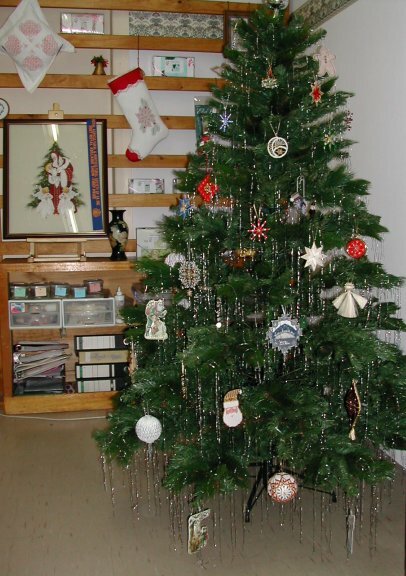 As Christmas is fast approaching I thought I would share a picture of the Tree we put up in the shop each year. In Adelaide most people and nearly all shops put their decorations up at the start of November, to coincide with our Christmas Pagent that is over 1km long and winds its way thru the CBD. As it is held on a Saturday morning, I don't get to see it in the flesh, but anyone who can't get there watches it on the TV. Our Tree is 6ft tall and we have decided that only handmade decorations will go on it, over the years the ones we have made ourselves have been added to by ones we have been given by our students and stitching friends. 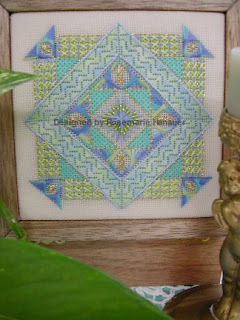 So now there is a lovely collection of all sorts of techniques including beading, goldwork, hardanger, Romanian point lace, Temari, Cross stitch, patchwork and more. 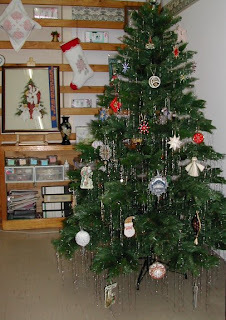 The final touch is the silver Lametta which is a very traditional thing to put on Christmas trees in Germany and everyone tells us it makes the tree look very special. I finally have got around to taking another photo of Monika's Goldwork bicycle. 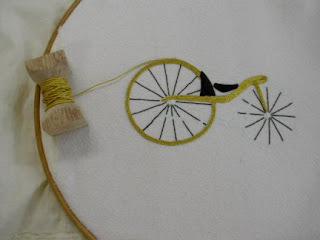 Even though it is a style of embroidery that progresses slowly (all that couching) the bicycle is taking shape. She might be able to ride it at the Tour Down Under next January (ha ha). I can't remember if I mentioned it before, but Stage 1 of the Tour Down under will be starting just 5 minuets down the road from us. So if you are in Adelaide for the cycling come and visit us at the shop.